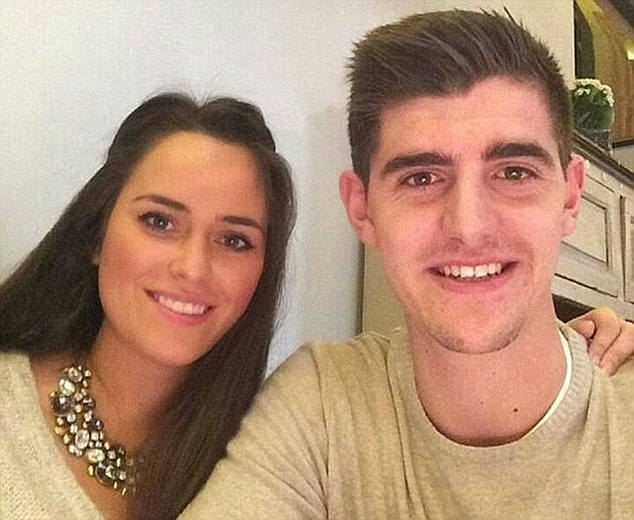 Chelsea goalkeeper Thibaut Courtois confirmed he has split from his pregnant girlfriend after years together. ‘My girlfriend Marta and I are no longer together. Since the beginning of September, we have decided to end our relationship, on amicable terms. ‘We both went our own way, even though she was already expecting our second child. She moved to Madrid, I stayed in London. ‘We still love each other and we get along very well, but we don’t have a romantic relationship anymore. ‘But we don’t run away for our responsibilities. We are first and foremost parents of a beautiful princess, Adriana, and our about to be born son, Nicolas. ‘We’ll strive to give our children the love and attention they deserve. Marta and I will be still present in each other’s lives, as good friends and the best parents for our two kids. Courtois and 24-year-old Spaniard Marta Dominguez had been together for a number of years having met when he was on loan at Atletico Madrid. Courtois and Marta have one child together and another on the way and she has returned to Spain to raise them there.